For other things by this name, see Albany (disambiguation). Albany is a city on the south coast of Western Australia. In 2006, there were 25,196 people living in Albany. The city centre is in between two hills, Mount Melville and Mount Clarence. Albany is built on King George Sound, named by Captain Vancouver in 1791. Major Edmund Lockyer started the first settlement here on 21 January 1827. 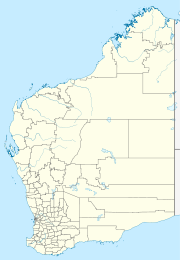 The Governor of Western Australia, James Stirling, named the city Albany in 1832 after Prince Frederick, Duke of York and Albany, the second son of King George III. ↑ Australian Bureau of Statistics (27 June 2017). "Albany (Sighicant Urban Area)". 2016 Census QuickStats. Retrieved 5 January 2018. ↑ "2011 Census Community Profiles: Albany". ABS Census. Australian Bureau of Statistics. Retrieved 15 September 2016. ↑ Australian Bureau of Statistics (25 October 2007). "Albany (Urban Centre/Locality)". 2006 Census QuickStats. Retrieved 2007-08-25. Consists of Albany SSD (Central) and the State Suburbs of Milpara, Gledhow, McKail, Bayonet Head, Collingwood and Lower King in the 2006 census. ↑ 4.0 4.1 4.2 "Landgate > History of country town names". landgate.wa.gov.au. Retrieved 28 March 2010. This page was last changed on 26 April 2018, at 04:04.